What Makes Laserfit® Scleral Contact Lenses Unique? You are here: Blog / Scleral Contact Lenses / What Makes Laserfit® Scleral Contact Lenses Unique? When it comes to complex vision issues, you want to be sure that your treatment choice will be customized for you. With so many new and advanced technologies in place today for restoring vision, it becomes hard to understand the differences in each treatment, and why one might be more effective than the other. With Laserfit® scleral lens technology, we treat patients with the most complex of vision issues, which cannot be corrected by ordinary optical devices or surgery. Surgery often causes the issues we fix, by deviating the shape of the cornea so that it no longer functions correctly. We know when treating these types of patients that they have already gone through tremendous lengths to restore their vision, and they are now looking for a miracle. If you are one of these patients, we understand your sense of urgency to find a treatment that will work without causing further issues, and we know how tired you are of trying every possibility that comes your way with no success. We want to be the ones to help you get your vision back, and that is the Laserfit® difference. It’s not the only difference, however. We have seen patients from 45 states and 39 countries all over the world who had faith in the ability of our scleral lens technology to work for them, and who now have restored their vision in some cases up to 20/15 or 20/10 with scleral contact lenses. Our unique, wavefront technology is patented and can address the presence of higher order aberrations in patients with diseases like keratoconus, who have found no other treatment that works. Dr. G. is the first to pioneer the use of the OCT scanner to precisely map the eye surface and to incorporate wavefront optics into scleral contact lenses. A 100% digital, non-invasive and cost effective process, Laserfit® does not require trial lenses or molding. A simple, painless and effective way to restore your vision exists with Laserfit® scleral contact lenses. We know that no two eyes have the exact same shape, and every eye has a unique optical fingerprint, therefore your contacts should be customized for your eyes. 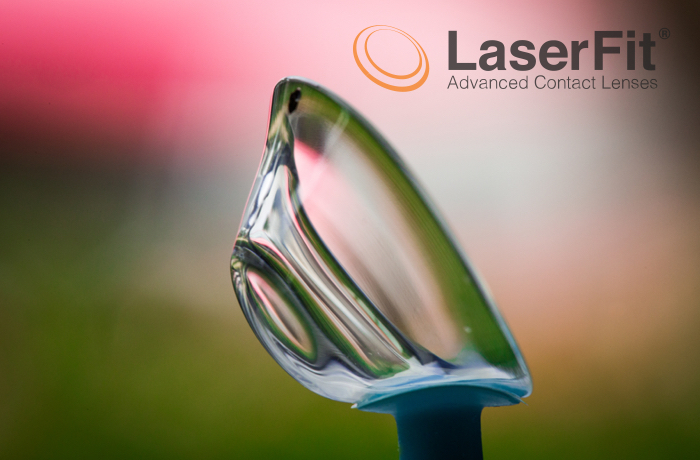 Contact us today to discuss whether Laserfit® scleral contact lenses are right for you.